A Quarter Century of Marriage - A Sterling Success! Staying married for 25 years is a huge achievement, and so what better excuse could there be for a great celebration? This milestone commemorates a lasting devotion and commitment to one other and is an event worthy of praise. The 25th wedding anniversary is traditionally associated with silver, so any kind of silver gift is just perfect to mark the occasion. If you're looking for the ideal present for your loved one, or for a special couple on the occasion of a silver wedding anniversary, you've come to the right place. The Eternity Rose can delight and surprise your partner or the special couple with a stunning silver-dipped rose - a gift that is ideal for both the 25th anniversary and a wedding day itself. A silver-dipped rose is somewhat unusual, a change from the generic silver offerings that can be found in the majority of stores. While standard silver photo frames, tankards and plates may find themselves soon forgotten, a silver-dipped Eternity Rose will be showcased in the recipients' home as an enduring memento of this once-in-a-lifetime event. There are few better symbols of devotion and undying love than the rose, but while real flowers fade and die, the stunning Eternity Rose shines on in radiance forever, its natural beauty being preserved for years to come. Subjected to a complex process of 60 steps, each genuine rose blossom is coated in pure silver and is then displayed in a stylish leather presentation case so that it is ready to exhibit. It is even possible to personalise the rose of your choice by engraving a special message upon the stem. The recipient(s) are sure to cherish such a bespoke gift with a message such as "Your love and commitment to one another is truly inspiring", or "To my beloved soul mate – Happy Silver Anniversary". 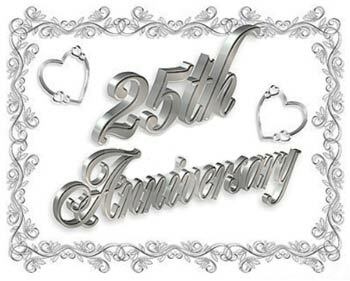 The tradition of celebrating the 25th wedding anniversary with silver gifts dates all the way back to the Holy Roman Empire, when husbands would present a silver garland to their wife on the special date. There was a comparable tradition in medieval Germany, although in that case, friends and relations would present the couple with the silver wreath. In 1922, the modern custom for allocating a theme to each year of marriage began. Emily Post's book "Etiquette" linked materials to many of the key milestone years, and this was built on in 1937 when the American National Retail Jeweler Association drew up a more comprehensive list. If you want to know more about the custom of giving gifts on specific anniversaries, you can click here. Anyone who wants to choose an appropriate gift for their loved ones on the occasion of their silver wedding could either go with the standard silver theme, or else opt for a gift that reflects the flower linked with this anniversary year, the iris. Whether it is you yourself who is about to reach this key life event, your parents, or even your friends, you should be thinking about how you can celebrate the occasion in fitting style. You may opt for an extravagant gesture such as a holiday, or huge family party, or prefer a peaceful night with just a few special people, but it is important to choose something that makes you or the couple feel happy and comfortable. A wedding anniversary is the ideal time to reinforce commitments and to rekindle the spark of a relationship. Here are a few great ideas to make any silver wedding celebration really special. Why not arrange a visit to some of the key places that have significance in the relationship? The place you or the couple went on the first date, the place of proposal, or wedding venue, there are few better ways to rekindle the romance of times gone by. Holding a party for your loved one or the honoured couple is one of the best ways to mark the day as significant, however planning the perfect event can be tricky. Try to restrict the invitations to only the most important people and prepare carefully so that everything goes without a hitch. Sending invitations - Make the invitations silver to fit the theme and either add a photograph of the loving couple, or some images that reflect love, such as swans or lovebirds. Silver Carpet - Instead of a red carpet, a silver one would be more appropriate for this event. 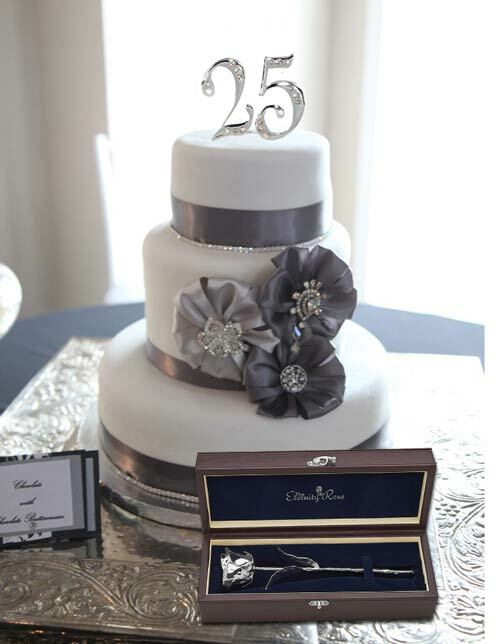 Carry the silver theme throughout the occasion with silver wrapped sweets, silverware glasses and silver sprayed flowers. Silver decorations - Using silver balloons, drapes and ribbons will beautifully reflect the occasion's theme. You could also decorate the venue with photographs of the couple. Capture your thoughts - Make a statement by capturing your sentiments in a hand-drawn picture, handwritten poem, or by playing a special and meaningful song for your partner or the couple. Entertainment - Liven the event up with a few party games like charades, and make sure to have great music playing to sustain the party atmosphere. Of course you mustn't forget the obligatory slow dance for the happy couple to dance romantically to. Thank your guests - Remember to thank everyone who came to the party and if you can, present them with a gift which reflects the silver theme, perhaps chocolate silver coins, a silver box of tasty treats, or simply a present wrapped in silver paper. Click here and find a full list of unique and romantic gift suggestions for all anniversaries. Although many celebrity marriages barely last 12 months, there are some well-known couples whose enduring marriages are celebrated. Denzil Washington and his wife have been together for nearly 30 years and have raised 4 children. They had their wedding vows renewed in 1995. Jerry Stiller and his wife Ann Meara - in the 1960s and 1970s, this couple were a stand-up duo and Jerry has penned a book on his happy marriage which has lasted 58 years. Billy Crystal has been making his wife, Janice, laugh for 42 years. Samuel L Jackson - even though Samuel is a big Hollywood star, he has been happily married to his wife, LaTanya Richardson, for 32 years. We hope that everyone celebrating their silver wedding anniversary has a memorable and wonderful day, and go on to enjoy many more happy years. Remember that marriage is an ever-changing entity so never take anything for granted, and continue to adapt to the ups and downs that life throws at you together. We wish you the very best for your future happiness. The Eternity Rose wishes you a very happy wedding anniversary.